Last week, I attended my first wedding of 2014 (as a guest, obviously!). I only have two this year which, compared to the SIX I had last year, is a little easier on making a decision when it comes to what to wear. If you're a regular reader, you'll know I love a bit of Coast as seen in the post I did on their SS14 collection back in July. I fell in love with this skirt from Coast and, decided to make the purchase a couple of months ago. It is such a flattering skirt and, it has pockets! Most girls will know why I am so excited about this as who doesn't love a skirt with pockets, am I right?! I'm sure this skirt will be featured on here again in the not so distant future as I have a couple of other ways of styling it and, it would be rude not to show my readers. Unfortunately, this skirt went in to their Summer sale and, I have it on good authority that it is now sold out. HOWEVER! Check out their website or visit your local store as they have some seriously amazing pieces in and, if their AW14 lookbook is anything to go by, I'll be making a few more purchases very shortly. Perhaps for the next wedding I have in October! What better way to end my Brighton City Guide series with a nice, refreshing drink. I'm letting you in on a little secret. Down this very narrow, cobbled lane there lies a cocktail bar. However, it's not obvious it's a cocktail bar as it's out the back of an old toy shop, now disguised as a juice bar. BYOC stands for 'Bring your own cocktail'. The concept is you rock up and pay £20 each which gets you two hours in the bar. What you may find slightly bizarre is that you're requested to bring along your favourite alcohol (the quirkier the better). The cocktail magicians have the syrups, juices and witty banter to create some amazing cocktails that you wouldn't usually find on a menu. The Hare and Hounds has recently gone under a huge refurbishment and knocked about 20 years off of it, going from dirty old man to flirty young man. The pub itself is Brighton's first brewery fresh pub, brewing fresh beer from the guys at Meantime in Greenwich. With the added bonus of La Choza taking over their kitchen (read about them here) this place is proving popular with everyone and, is a welcome breath of fresh air to the London Road area. This bar gives you something no other bar in Brighton probably does - control of their soundtrack for the evening. Accessible via your smartphone, simply log in to their online jukebox and select your favourite tracks for the night. It's a great idea and the bar itself boasts a long list of cocktails, bottled beers and wine. This cocktail bar has been around in Brighton for years. It's a bit of a random place mainly as it's no bigger than my front room and, it's above a Mexican restaurant. But, don't let that put you off. The staff know their stuff and will happily freestyle if you can't make up your mind - just let them know what you like and leave it in their hands. I always end up here at some point on a night out because the cocktails are so good! A popular pub amongst a lot of my friends, this is the place to go if you like your whiskey! It hasn't changed over the many years it's been open and, is a pub where most of the punters in there are regulars but, I love it and have had many a good night in there with friends. I've mentioned them before in my food guide but, their bar is worth a mention alone. They have a great selection of cocktails, craft beer, wine and cider. They also do a great 'Hard shake'. 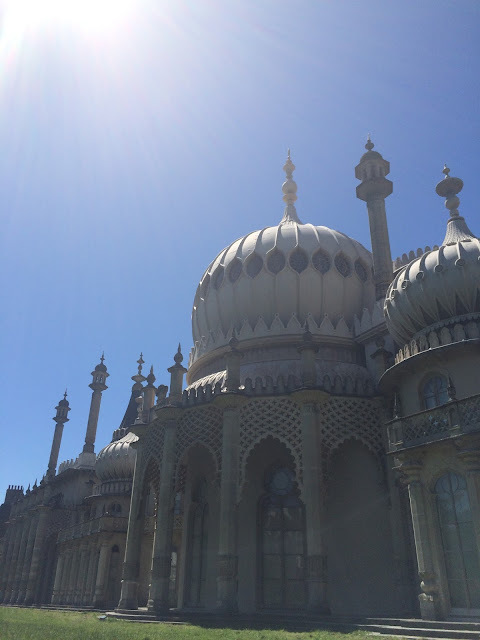 Next up in my Brighton City Guide series, another one of my favourite things to do in this lovely city. Brighton is a great place to do some damage to your bank balance (trust me, I've done it ALOT) it's the perfect place to visit if you want to indulge in a spot of retail therapy. 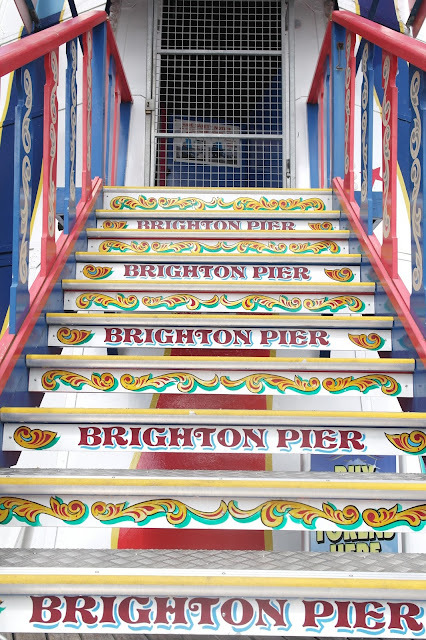 Although Brighton is known for it's vintage and second-hand shops, there are also a number of independent boutiques, chain stores and homeware stores. 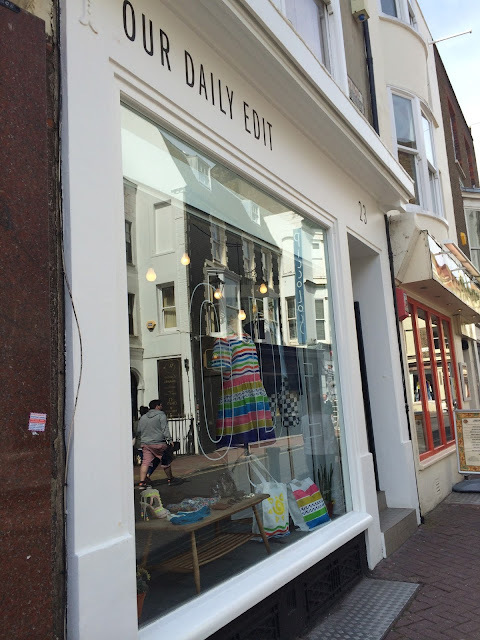 This boutique is fairly new to Brighton and stocks great pieces from emerging designers to current and more established brands, including 5Preview, Petit Bateau and, my favourite footwear designer, Sophia Webster. 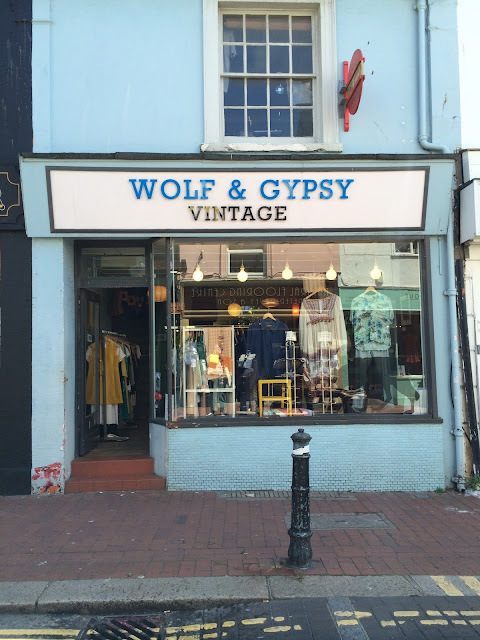 A great little shop to pick up the perfect vintage piece and a favourite with a lot of Brighton stylists, Wolf & Gypsy is packed with vintage gems from the 1920s to the 1980s. An established boutique, Nola stocks labels such as A.P.C, American Vintage, Ganni and Nudie Jeans. A great little shop right in the heart of the North Laines. Offering some gorgeous, simple homeware and lifestyle pieces, Workshop Living is a great little shop to visit. Considered a Brighton institution, Snooper's Paradise is the city's version of Aladdin's cave! You will find everything and anything in here and, is a great place to get lost in for a couple of hours. Somewhere not to miss on your visit. This cute little shop is fairly new to Brighton and, has some great pieces. From flamingo cushions to sausage dog mugs to baby clothes and some gorgeous vintage-inspired jewellery, this place is great to pick up a gift for a loved one. We really are spoilt for choice in Brighton - this is just a small edit of my favourites! If you need any more recommendations, just get in touch! This post in my Brighton City Guide series is all about one of my favourite things. There are so many places to eat in Brighton and, like everywhere else, it can be very hit and miss. Like most cities in the UK, we have all the chain restaurants, which, the day-trippers seem to target the most. Over the last year and a bit, there have been some great places open up that have become hits with the locals, all a little too good to keep a secret. A little out of Brighton and along the seafront, this little bakery is definitely worth the journey. Everything is made on site and is fresh everyday. My weakness is their Portuguese Custard Tarts and pastries. GF people are catered for too. They're also open until 5.30pm everyday, including Sundays. This is somewhere I like to visit when I want to work remotely. I grab my MacBook and head here. Their hot chocolate is amazing and they do a variety of breakfast/brunch treats including pancakes. Plus, they've just opened up a pizza van outside Brighton station which I have on good authority, is lovely. What's not to like? Open all day, this is where I like to go for breakfast after a late night - they offer great hangover cures in the form of a breakfast burger, pancakes, full English and Huevos Rancheros. Lunch and Dinner are also great and, their cocktails are brilliant. This place is in my top three restaurants in Brighton and a place I recommend to any food lovers out there. The menu changes almost daily and is a great place to check out if you’re obsessed with food as much as I am. I love going for a long lunch but, dinner is just as good and the small team are all lovely and know their stuff. Mexican street food at its best. Their burritos rock my world as well as their VERY lethal frozen Margaritas. It’s very popular and quite small so, prepare to wait for a table or, head to one of my favourite pubs The Hare and Hounds, a 10 minute walk away where they've taken up residence in the kitchen. The pub itself is Brighton's first brewery fresh pub, brewing fresh beer from the guys at Meantime in Greenwich. This is my favourite restaurant in Brighton - amazing steak, lovely service and they've just started doing truffled mac n cheese (dribbles on keyboard). They also do the best roasts in Brighton on a Sunday. Perfect for the meat eaters out there. This little gem of a restaurant is nestled away off of one of the main roads in Brighton, towards Hove. Everything on the menu is local and the fish is sustainable. It’s a great little place to take someone you’re wanting to impress and romance! This place is my go-to when I’m missing Paris! With 24 different Macaron flavours (my favourites are the Salted Caramel and Tonka Bean and Peanut) and a unique collection of cakes and pastries this place is a must for anyone with a sweet tooth. They also do breakfast and lunch. This cute little shop sells yummy cupcakes. Eat in and sit by the window to watch the world go by or, take away they do very delicious flavours including my favourite, Banoffee. They also have a kitchen located round the corner from the shop where you can learn how to make cakes. Brighton has a great food scene and, one thing I've started doing this year, is attending supperclubs. These are great to meet new people at and eat some very yummy food cooked by talented people. Check out Tabl. This site is perfect for planning a visit to a supperclub and has lots of different ones on their site. CanTina: Tina is the superwoman of supperclubs! Featured in Grazia magazine and Stylist, she hosts twice a month in her lovely home and, does the occasional pop-up at a venue in Brighton. Dinner consists of five courses and there's a cocktail thrown in as well as a pudding tipple. Worth the money and, I guarantee you'll have a laugh! There are so many other places to try out but, I didn't want this to be too long! Feel free to Tweet or email me (info on Contact page) if you want any more recommendations and, I'll be doing the odd review on here soon. Anyone who will listen to me, knows about my love for Brighton. It is my hometown - I was born here and grew up here. I've spent a lot of time running round the streets and swimming in the sea and no, I can't walk perfectly on the pebbles barefooted. It's impossible! I've been meaning to do a city guide for a while as a lot of people get in touch with me asking for recommendations and, although Brighton is a small city, there is so much to do which is why I'm breaking it down into a mini series. First up, a few little things I like to do in Brighton. Anyone who visits Brighton for the first time is always a little puzzled by this gorgeous landmark. If you have time, take a look inside (it does cost) as it's gorgeous and so decadent! I like to sit in the gardens surrounding it and people watch on a sunny day. I find myself very lucky to live right by the sea and, going for a walk along the front is lovely whatever time of year - it really does blow the cobwebs away and makes you feel very refreshed. Especially if it's a windy day! Otherwise known as The Palace Pier before they decided to rename it, this place was a huge part of my childhood. I used to spend most of the Summer holidays on the pier attempting to win a cuddly toy, gorging on hot doughnuts, or spending all my pocket money on the 2p machines - something you have to do when you visit! Something that attracts a lot of people to Brighton, the Laines are full of antiques, jewellery and one-off boutiques (more on those in a different post!). I love walking around the cobbled streets talking in all the sparkly antique jewellery and finding cute shops. You also stumble across some great street art lurking on the side of buildings. Known fondly to me as 'my front garden' this is where you'll find me in the Summer. Brighton beach can get extremely busy and noisy (especially between the two piers) so, I always stick to Hove beach or, Hove Lawns where you'll find some great events happening as soon as Spring hits. Including Brighton & Hove Food Festival and Paddle Round The Pier. I love taking down dinner, a bottle of wine and watching the sun go down. I never did a July Beauty Favourites post. But, that's because I was saving it for now and doing a bumper edition focusing on my favourite Summer products. Like everyone should, I take care of my skin all year round, especially in the Summer. I recently picked up a new suncream specifically for my face by my favourite skincare brand La Roche-Posay. I'm so glad you can buy their products in Boots now - albeit, they're more expensive than they would be in a French Pharmacie. This suncream is moisturising, non-greasy and not heavy in the slightest. It's brilliant for people with sensitive skin as I find that some suncreams can make me breakout. The Aloe Vera Gel by Banana Boat is great for smothering yourself in after you've been in the sun for the day. It's great for irritated, sensitive and sunburned skin during summer and is amazingly cheap. Stick it in the fridge and then use it as a mask for your legs and face. An added bonus is you can pick it up whilst doing your food shop - I picked mine up in my local supermarket. My Bioderma Hydrabio Refreshing Water Spray is great for when you get a little too hot in the sun. It's great for your skin and is so refreshing. I bought it last time I was in Paris and, I can't say I've seen it available over here at all but, there are some alternatives about! A lot of people I've spoken to say that the sun really helps their skin clear. However, I seem to be the opposite! I always seem to breakout when I sit in the sun for a few hours. Hence, why I wear a specific suncream for sensitive skin. My skincare routine is the same all year round. I swear on the Bioderma Crealine and, I picked up a travel sized one when I was last in Paris - saves me carrying around my big bottle! This product is so good for sensitive skin and is really soothing. Another 'hero' product by La Roche-Posay is the Cicaplast Baume B5. It is really, really good for soothing sunburnt skin and can be used all over the body. It's also a great moisturiser and I use it on my face as part of my night-time skincare routine. The Surf Spray by Bumble and Bumble was a Birthday present from a friend and, I'm not sure how I've *not* used it before now! Perfect for creating that just-been-surfing-and-now-my-hair-looks-perfectly-wavy look. Spritz it on nearly-dry hair and scrunch. Another Birthday present, and one I was really looking forward to trying, Daisy Dream is the latest edition to the Marc Jacobs fragrance family. I'm a little bit obsessed with the packaging of his fragrances - I mean just look at this one below. The scent is really light and airy with a floral and fruity touch and, has coconut water in which intrigued me so much as I've never heard of coconut water being used in a fragrance before. It's a perfect Summer fragrance. During the Summer months, I live in sandals so always make sure my toenails are looking pretty. I tend to leave my fingernails bare and give them a little break from nail polish and gel polish unless I have a special occasion like a wedding. The colours below are all ones I've been coveting this Spring/Summer. Each colour is so different and I try to change it up as often as possible. The No7 Gel-Look Shine lasts for so long and the colour is gorgeous! All of these colours seem to make me look more tan as well! 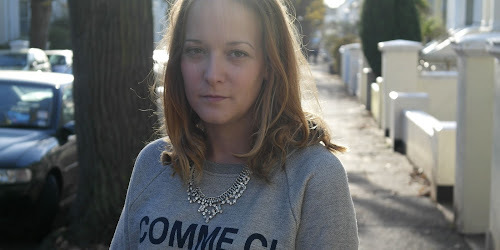 For me, Summer is about going as bare faced as possible! If I'm heading to the beach, I won't bother with make up. In the evenings or, if I need a bit more coverage, then I'll use a BB Cream with a bit of tinted moisturiser mixed in. But, I find less is most definitely more in the Summer. The Elemis Pro-Radiance Illuminating flash Balm is my favourite product and something that is going to be in my make up bag all year round. I wear it on its own, for a healthy glow, or underneath my BB Cream. The bronzing stick by No7 - I've been using it on my cheek bones, perfect for that little extra glow. The Clinique chubby stick is fast becoming a favourite of mine as it's moisturising and, you can build on the colour. I've been using 'Babydoll' by YSL since it came out and, I love it. It's great as it doesn't clump and, is smudge proof - perfect for this time of year! Touche Eclat has been a permanent fixture in my make up bag for years. I love products that do exactly what they say they're going to do and, this is one of them. Phew, that's it! Are there any products you can't live without in the Summer?